An email processing utility, that provides an easy, and effective way to transfer data from email to other applications. MsgParse exports data from your email messages to user defined customized flat files, that can be used to import to other applications or take your data directly to a database using ODBC connection. This is a great tool for processing email sent from web forms and Internet services. An email processing utility, that provides an easy, and effective way to transfer data from email to other applications. 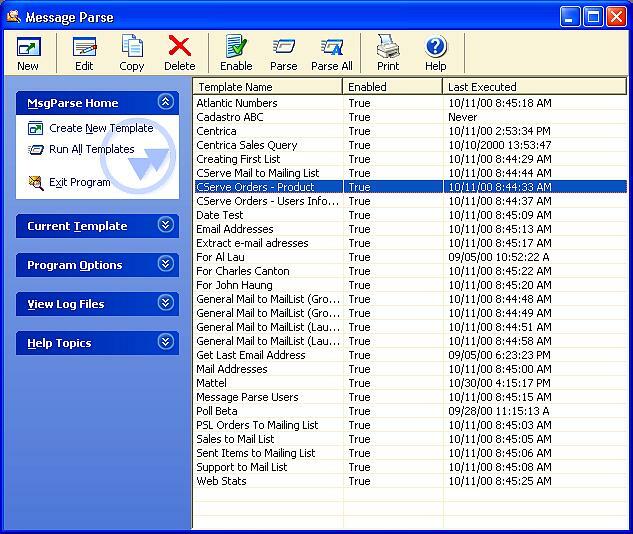 MsgParse exports data from your email messages to user defined customized flat files, that can be used to import to other applications such as database and spreadsheet programs. This is a great tool for processing email sent from web forms and Internet services. MsgParse gives you the greatest control over the extracted data. You can also extract data from msg text attachments. With user defined filters and the ability to create multiple templates there is virtually no limit to the possibilities. New template wizard makes creation quick and easy. Can be configured to use multiple POP3 mailboxes, or MAPI compliant mail clients (like Outlook or Outlook Express) as the message source.